For those of you with first year daughters who went through the recruitment process, you likely heard a lot about it over the past week. Bids went out over the weekend and for some it was a joyous process, for others a disappointment. I suspect for a good many of our girls, the process was bittersweet, because even if they got the bid they were looking for, they surely have friends who withdrew from the process (often for not liking their choices) or were not successfully placed. For those who went through recruitment and got bids, they will now be pledges in their new sorority. Each organization has a slightly different feel to it, but there will be required events for the new pledge class, they might have to wear their Greek letter shirts on certain days, and probably will have to have a pledge pin on them at all times (at least that’s how it was in my day, though observation seems to suggest it’s still very similar). There will be parties, and date functions, and usually an off-site event weekend. There may be a ton of new paraphernalia in the girls’ rooms bearing their new Greek letters. There will likely be sisterhood secrets they cannot share. There will also be some subtle shifts in routines in the coming weeks, and it is a period of adjustment that tends to be a little harder for the young women who are not Greek. It might be something small, like the newly Greek friend from the hall who always went to lunch with your daughter after class on Tuesdays now ends up joining her pledge sisters for lunch. There will surely be small differences and distinctions from the first semester. And in the first few weeks of the semester, these differences seem very obvious. Once classes are going and people settle into their academic routines, some of the novelty will wear off, and things will regain their equilibrium. It can be an anxious time for all parties. The Greek friend may feel guilty that she got into her sorority of choice, knowing the non-Greek friend did not (but really wanted a bid), or she may feel reluctant to talk about her new Greek experiences for fear of hurting the other’s feelings. The non-Greek friend might be reluctant to talk about her disappointment for fear of looking like she has sour grapes. I am firmly convinced that the way out of uncomfortable feelings and anxieties between friends is to talk. Openly, honestly, sensitively, compassionately. If a young woman doesn’t tell her friends how she feels or what she needs, the friends can’t help her. So my best advice, whether your daughter is the Greek or the non-Greek (by choice or otherwise), is to talk to each other. 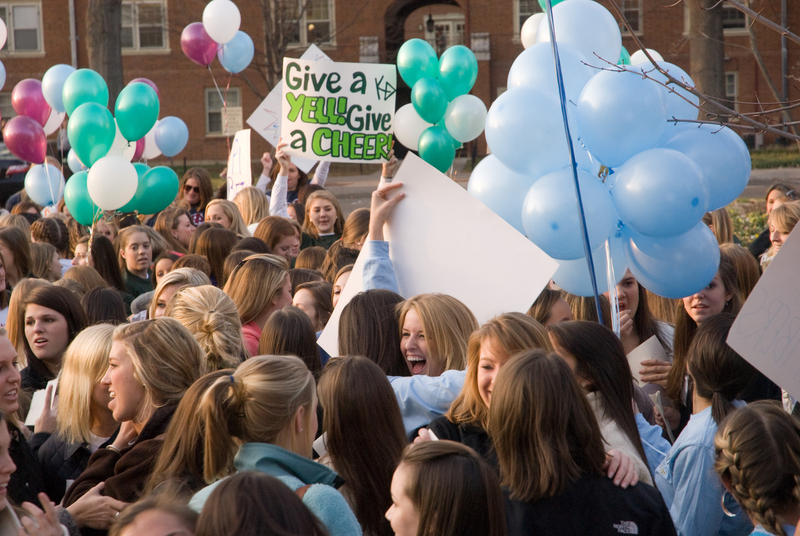 If your daughter is Greek – remind her to be sensitive to her friends and hallmates who did not have positive recruitment outcomes. Remember to include her first semester friends in plans, and don’t abandon everyone in favor of the new sisters. Be sensitive to non-Greek friends’ feelings and don’t talk incessantly about the sorority. Be understanding of non-Greek friends’ emotions. Maintain some balance – Greek life should not be your whole life. If your daughter is not Greek – remind her to be generous about her Greek friends’ outcomes and try to be happy for them. Don’t disparage Greek life because you are not a part of it, but respect your Greek friends’ choices. Look for other girls on the hall or in classes who are not Greek and befriend them. Some may have lingering hurt feelings over the recruitment process and could use a good listener. Take this time to become comfortable with yourself and your independence. Try getting involved in a new organization on campus – a club sport or intramural, Student Union, a campus ministry group, the University Theatre, Volunteer Service Corps etc. etc. – something to give you a social outlet. Sometimes a bit of struggle will help you grow in ways you had not imagined. And if you are feeling like you could use support, seek it out (Campus Ministry, Counseling Center, RA, academic adviser, faculty or administrators you trust).